Liposomes have long been used for drug delivery and excellent tools for model membranes due to their unique properties. Research on liposome technology has progressed from conventional liposomes to long-circulating liposomes. It has been shown that inclusion of poly(ethylene glycol) (PEG) in liposome composition extends blood-circulation time while reducing mononuclear phagocyte system uptake (stealth liposomes). Despite all the work done, liposomes still have not attained their full potential as drug and gene delivery vehicles because of their insufficient morphological stability. 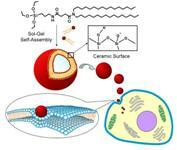 Biomimetic cerasome (partially ceramic- or silica-coated liposome) has drawn much attention as a novel drug delivery system because its atomic layer of polyorganosiloxane surface imparts higher morphological stability than conventional liposomes and its liposomal bilayer structure reduces the overall rigidity and density greatly compared to silica nanoparticles. The present review will briefly outline the characteristics of liposomes and look at the related problems and solutions proposed, with a focus on advanced cerasomes. In particular, we revisit the literature relating to high-stability, biocompatibility, drug and gene delivery, mimicking biological energy transfer, and future trends concerning novel cerasomes. Cerasomes are more biocompatible than silica nanoparticles due to the incorporation of the liposomal architecture into cerasomes. In a word, the silicon strategy provides a simple and widely applicable tool to overcome general problems associated with current liposome technology of drug and gene delivery.